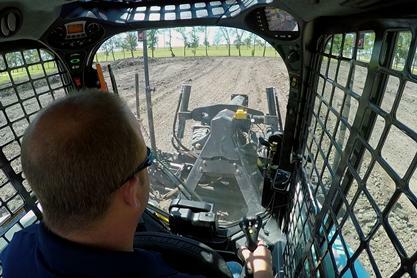 A sonic tracer and cross-slope system is available for use with Bobcat’s larger grader attachments. Whereas the laser-guided systems require a laser transmitter and can only follow a plane of light, the sonic/slope system will follow the terrain below the sonic tracer (mounted on one side) and maintain a consistent cross-slope that has been predetermined. This system also works well on jobsites in which the transmitter may not have complete visibility to the receivers at all times.